I’ve been thinking about today a lot, but I can’t believe it actually came. It was one year ago that I published my first ever recipe. I know that most bloggers follow up on that statement with “I am so embarrassed of that post” or “I can’t believe how far I have come since then!” or “it was totally on a whim that I started my blog!” But I am not going to say any of that. Sure, I think I have come pretty far since I wrote and photographed that recipe, but I am proud of that post, just as I am proud of every post I have up on this blog. This blog wasn’t started on a whim, it was the result of weeks of planning that followed months of deliberating. I am not spontaneous, and I don’t like to jump into things without knowing what I am getting into. Before my first post, I spent an hour getting a one-on-one photography lesson with one of the professional photographers at work. I read a ton about food photography, about recipe writing, about recipe attribution. Then I spent days deliberating over a name for the blog. Next, I read all about the various hosting options and debated endlessly with myself about spending the few dollars to get my own domain. And then I finally pressed publish. And through it all, I dreamed of “making it” in the food blogging world, but being the super realistic and practical person that I am, I didn’t expect many, if any, readers. And yet, you came. I remember the first day that I broke a hundred hits. Then the first day that I broke a thousand. And the day I reached 100 thousand hits. I remember the first time someone blogged one of my recipes, the first time someone invited me to guest post, even the first time a stranger commented on my blog. Each one is a special little memory in a sea of amazingness that’s been the last year of blogging. So many extraordinary things happened this year. I had my work featured in a magazine. I started writing a baking column in another magazine. I bought a “fancy” camera and learned (somewhat) how to use it. I was interviewed, I was recognized. But most of all, I met some of you, some of the most amazing, friendly, sweet and talented people in the world. Fellow bloggers will get this, but for the non-bloggers reading this, you can’t begin to imagine it, but some of the sweetest moments of this entire year have been letters from regular people like yourselves, who invited me and my recipes into their kitchen, then took the time to write me a letter and tell me about it. Every minute of work that has gone, and will go into this blog is validated completely when I get an email like that. Honestly, I wish I could throw you all a giant cookie party to thank you for coming, for reading, for commenting, for baking and for cooking. But that isn’t very realistic. So instead, I decided to celebrate in the second best way. I decided to giveaway one of my favorite cookbooks to one lucky reader. No marketing gimmick, no sponsored giveaway, no paid ads. Just me, thanking you with a cookbook. Okay, enough sappiness. Let’s get onto the cookbook giveaway. I chose to giveaway Dorie Greenspan’s Baking From My Home to Yours. It’s a classic cookbook that every avid baker needs on their bookshelf. If you already own a copy, enter to win it for a friend. It’s a book to be treasured. Required entry: Leave a comment telling me how you found my blog, or what your favorite recipe(s) is/are. Or both. I love hearing from you! For additional entries: leave a separate comment for each entry! 2) Like Overtime Cook on facebook. 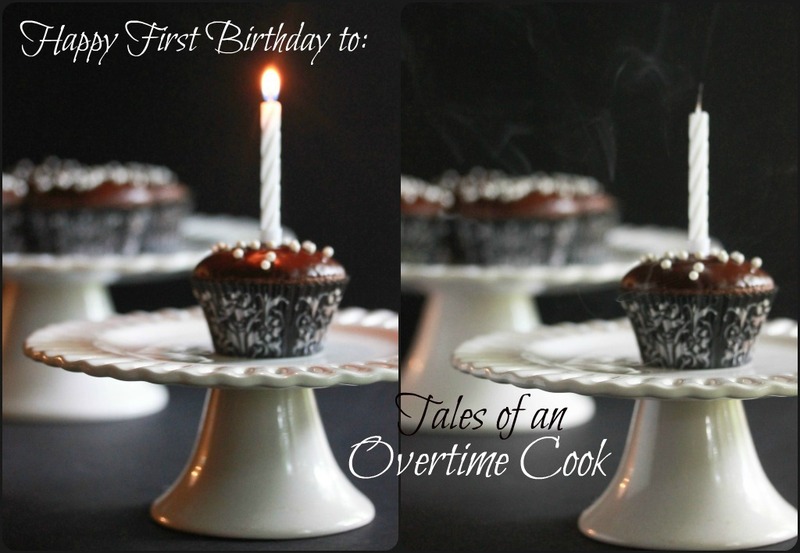 3) Follow Overtime Cook on Pinterest and pin one of the images in this post. Giveaway is sponsored by me. It ends at 11:59 PM on 8/15. Winner will be selected via random.org. Prize can only be shipped within the continental US. Winner will be notified via email or twitter. And now, what would a birthday post be without some birthday cupcakes? Preheat the oven to 350. Line a 12-section muffin pan with paper liners and set aside. In a small bowl, whisk together the flour, cocoa powder, baking powder, baking soda and salt. Set aside. In the bowl of your mixer, beat the butter or margarine until smooth. Add the sugar and beat for about two minutes, until they are completely combined and creamy. Add the egg, then the egg yolk and vanilla, beating for about a minute after each addition to fully incorporate. Turn the mixer to slow, and beat in half of the dry mixture. Add the buttermilk, then the remaining dry ingredients. Beat to combine. With a rubber spatula, stir in the melted chocolate. Divide the batter evenly among the prepared cups. Bake at 350 for 22-24 minutes. Remove from oven and set aside to cool. Meanwhile, prepare the glaze: Melt the chocolate in a heatproof bowl over boiling water (double boiler style). Set aside to cool for 2-3 minutes. Using a rubber spatula, stir in the confectioners sugar. Stir in the butter, one piece at a time, until smooth. Dip the cupcake in the glaze, and swirl slightly, then lift up. Decorate with sprinkles of your choice. Miriam, I am so happy you started blogging so I could get to know you. It’s been a pleasure reading your blog and being welcomed into your world. You are a joy to know and read. Your attitude and your recipes are both stellar. Big hugs and huge congratulations on your first of many blogiversaries. I can’t even remember how I found your blog. I was vegging out at my computer, skipping from one Kosher food blog to another and I came across yours. The recipes look nice and I am thinking of trying the strawberry lemonade but substituting blueberries for the strawberries because I just brought home a huge container of beautiful blueberries from Costco. I’d love to win the cookbook. Happy Blogiversary to you and best wishes for many more good things. My friend sent me a link to one of your recipe posts a few months ago when I was making my son’s bar mitzva. I love baking (because of the end result…) and am always looking for new recipes and party ideas. I started looking through your posts, loved the one from your sister’s vort & now I check in all the time! Congratulations, Miriam! That’s a really exciting milestone! My favourite recipe has been your milk chocolate fudge. Once I got it right, it was delicious! These look divine! I have only just stumbled across your blog (and live in the UK) so I guess I am not eligible for the giveaway but I wanted to say how much I love it already!! I have just started blogging but have been reading blogs for years!! Yours is well and truely bookmarked!! Wow, a year goes by way too fast. Congrats! I am so happy for you! Congrats and what a great reflective post. I think I first found out about your blog on facebook. Someone must have shared a link with an amazing picture of something chocolatey. Became an immediate fan! Happy 1st blogiversary! I don’t remember how I found your blog, but I love the recipes! I don’t remember where I first saw your blog, but I keep checking it because the recipes look delicious and I love your stories. Great work, and happy anniversary! You told me about it, and I’m glad you did! Congratulations! I’m so proud of you! I found your blog through a link sent to me by a friend. It’s great! I found your blog on Twitter! Kristen retweeted your tweet about your giveaway and I’ve been on the lookout for new foodbloggers to follow! It’s hard to believe you’ve only been blogging a year! Judging by your posts, I’d say way longer. You have more patience than I did. I just started a blog without any planning. In fact, it wasn’t until this past January that I cared about quality of my blog, the photos, getting my domain, building my readership. I don’t remember many of my milestones bc I didn’t care at the time. Glad we are friends and maybe someday we’ll meet for real! Happy blogiversary! Those cupcakes look fantastic. It definitely is surprising you’ve only been around for a year! I think I found your blog from you commenting on mine, but I could be wrong. Either way I am so glad to be a follower of your blog and happy 1 year! I found your blog through Kosher Recipe Link Up #1: Frozen Desserts! I found your blog through a retweet on Twitter! I liked your Facebook page. Congrats on a year! Our blogs started within a day of each other (I feel like we have kids the same age! ), and I think I found yours through a comment you left on mine. I probably haven’t missed a post since! I like Overtime Cook on fb. I follow Overtime Cook on pintrest and pinned an image from this post. Oh my, I couldn’t have written your recap of starting a blog any better – you said it all, and perfectly! I found your blog through foodgawker. Happy Anniversary!! Oh my, I couldn’t have written a recap of starting a blog any better myself. You said everything I felt, and you said it perfectly! I found your blog through foodgawker – this is my first visit. Happy Anniversary! Congrats on a year! I found your blog via foodgawker! I don’t remember how I found your blog. I think it was a recipe quoted on another blog. But, since I found you (which wasn’t so long ago) , I have really enjoyed your blog. It’s so creative yet down-to-earth and practical. Thanks!!! found u through ur sister in law 🙂 she works with me! and i absolutely LOVE your blog, i shared it with all my friends, and we have all tried stuff out! I found you on foodgawker. Cupcake looked good in picture. I will try this recipe for shabbos. I must tell you your recipes do not disappoint. They are right on the money. What you see is what you get. Thank you. Love your blog! Especially the pictures! Everything always looks so good. I found out about your blog through Ami Magazine. Happy Anniversary! I found you on Foodgawker. Happy Anniversary! 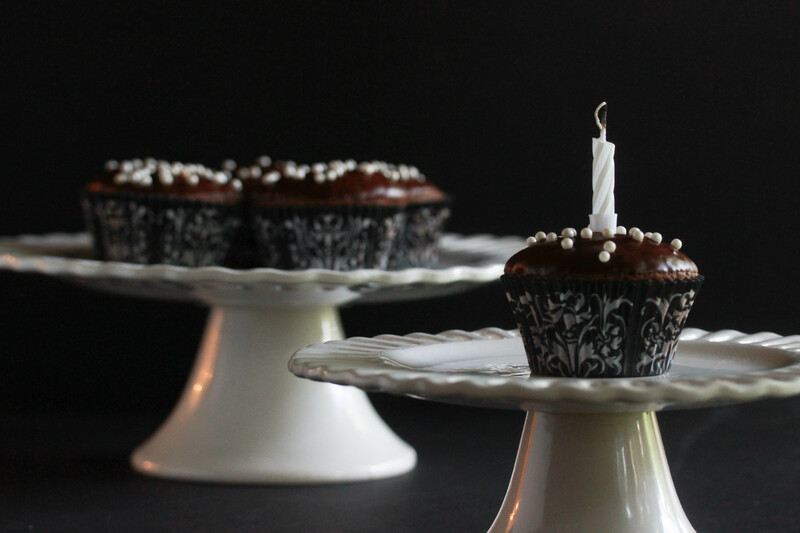 Congrats on a year of blogging amazing recipes! I love the professional pictures, and I’m so glad you started writing about photography, something I always had an interest in. Good luck in the future! Happy Anniversary! We never met, but between your blog posts and the friends we have in common, I feel like we’re friends! I think I originally found your blog on Cook Kosher. My favorite recipe so far is the Triple Chocolate Oreo Chunk cookies on the non dietetic side and the Spinach Cheese Spaghetti Pie on the healthy side. I hope to make these cupcakes for an upcoming sheva brachos. I think this might be my new favorite recipe! These cupcakes are stunning! Congrats on your first year, here’s to many more! I’m not sure I can pick a favorite recipe. Anything I tried was great. But I can tell you which recipe I pass on the most often – the garlic and shallot topped smashed potatoes. It’s delicious and looks really nice and is easy to make. 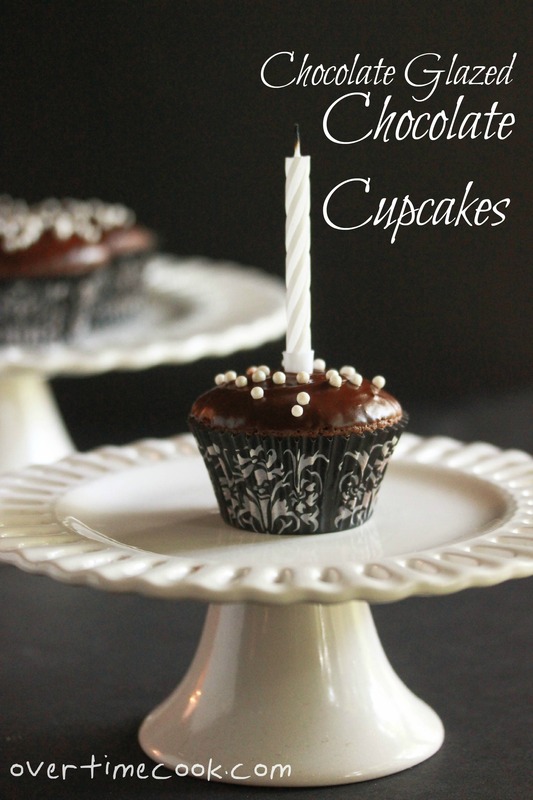 I came across your blog via Foodgawker… very enticing cupcakes… Cheers to one year! I can’t even remember how I found your blog. I was vegging out at my computer, skipping from one Kosher food blog to another and I came across yours. It may have been from site called Imamother. Does this qualify as an entry? Happy Anniversary. Perfect celebration cupcakes and wonderful wrappers. All the best for another excellent year of blogging. Happy Blogoversary! Having recently celebrated my own, I know how gratifying it feels to reach that milestone. It has been a pleasure watching your blog blossom over the past year. It has truly bloomed into something outstanding. I love how your photos turned out! Keep up the good work! I am a fan of overtime cook on facebook! I found your blog through Twitter, I think! And I’m glad I did. Congrats! I was looking for good Jewish food blogs and I found yours. Love your mix of healthy food and amazingness desserts. Keep up the good work! I found your blog when there was a contest for the best Kosher food blog, which I’m pretty sure I saw on FB. I went through the list of blogs, ignored some, and bookmarked the ones I liked. Yours was one I bookmarked. My favorite recipe is your original zebra cake! Made it once with Rich’s Whip, the second time with soy milk – great each time and worth the effort! this looks yummy!! happy 1 year blogiversary!! I would love to win this..do I have room for another cookbook idk but it looks awesome nonetheless! following you everywhere now so I can see more of your creative treats. why no google connect or bloglovin though? I love that iced mocha drink! All the recipes I tried were amazing! Congrats on your one year!! Loving your blog! I subscribe to your blog on Google Reader and look forward to your delicious food. I have so many starred ones I want to try!! Loved your broccoli kugel muffins, smashed potatoes with shallots on top, and breaded cauliflower in particular. Mazel tov on a wonderfully delicious and amazing blog!! I found your blog on Norene’s Kitchen on facebook. 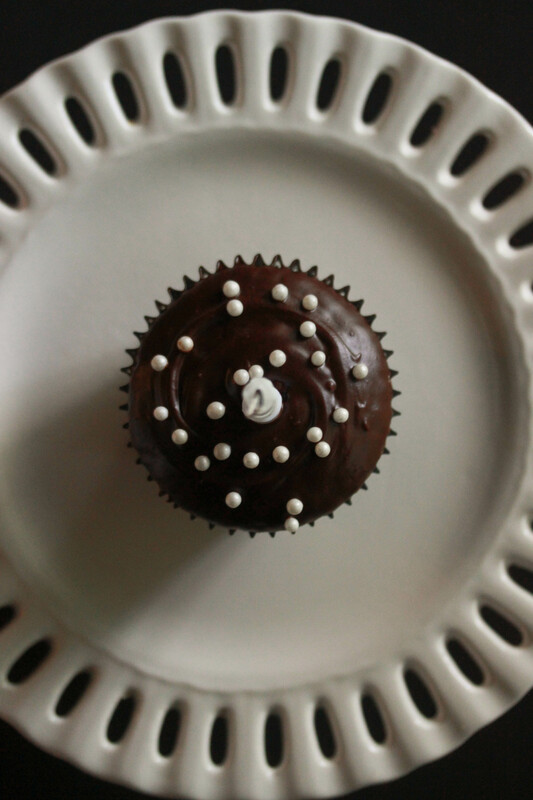 Your cupcakes look amazing, happy blogoversary and many more. I found you from Kim, at Cravings of a Lunatic! i found you with a google search, ironically for “overtime”. I liked the headline and jumped in. i already Liked Overtime Cook on facebook. Chocolate chip cookie dough cheesecake! Great blog! I found you by seeking other cooks with not enough time. I’d so love a dorrie greenspan cake cookbook!!! I don’t remember how I found your blog but I am happy I did. I LOVE it. I love reading your posts and looking and the stunning pics. Thanks for having the greatest blog in the world!!!! I can’t remember how I found your blog but I am always excited when I see your posts in my inbox! I like you on Facebook and follow you on Pinterest too! Dont remember how i found your blog. congrats! I think you know how I found your blog….. Love it and share it with anyone who will listen! Keep up the great work, Miriam! Here’s to many more happy years of blogging, and lots of great readers! Blog was forwarded to me from your SIL @ work- LSG. Gorgeous photos! I like the smashed potatoes recipe. Was really yummy! someone told me that a BYM graduate started a food blog and I had to check it out! you have a great blog! I loved your mocochinno recipe! whoever i told/made it for was amazed! (i served it with a scoop of ice cream) ur blog is appetizing n nice! keep up your work! Congrats n lots of luck! I Liked Overtime Cook on facebook. I Followed Overtime Cook on Pinterest and pined one of the images in this post. found the blog on facebook, love your blog, the recipes are great! I found you on fb through a friend. I baked your chocolate cheesecake for my son and daughter in law’s sheva brachot this past Shabbat using tofuti cream cheese. It came out great…I got many compliments. Thanks! I found your blog because I know you 😀 Also, you make really, really yummy food and goodies! Also, I like your blog on Facebook. I found your blog through another blogger and always check in to see whats new. LOVED LOVED LOVED your party blog. I sent it to everyone. Simple yet elegant. Such a fresh look. HAPPY 1ST ANNIVERSARY! Here is to many more years of blogging. “Keep them coming! !”thats the only thing I can say….